Get better device OS for playing HD movies/videos from review of iOS 8 vs Android 5.0 Lollipop comparison. On September 17, 2014, Apple released iOS 8 coming with big improvements while Google pushed out new Android 5.0 Lollipop debut for Nexus 6 and Nexus 9 on November 3, 2014. Here, let's dive into Apple iOS 8 vs Android 5.0 Lollipop comparison to explore new features of the two dominated mobile operation systems in aspect of design, performance, battery life etc, and get the answer of which one is better for movies/videos playback. How to Play DVD Movies on iOS 8/Android 5.0? Rip DVD, ISO image, video folder into any video format for playback on iOS 8/Android 5.0. We cheer for the new released systems for devices and cannot wait to grab every piece of them. Maybe you are in middle with how to select the most appropriate system fitting with your habits to play movies/HD videos on portable devices. The following differences between iOS 8 and Android 5.0 will help you get the best answer. 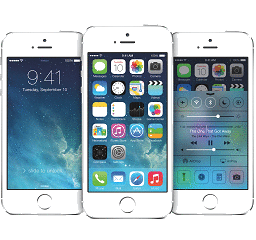 Similar to iOS 7, iOS 8 inherits flat design known as skeuomorphic but brings cleaner and more colorful images to users. 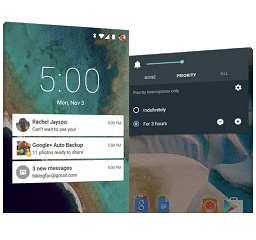 Android 5.0 Lollipop demonstrates a new Material Design for Android with a bold, vivid, responsive interface leading increased feedback on touches. Moreover, it adds shadows and familiar visual elements to appearance and offers a completely new feeling of this great system. Both iOS 8 and Android 5.0 Lollipop are compatible with 64-bit devices, which mean that users can play HD movies/videos on iOS and Android devices which feature bigger sizes and improved resolutions speedier and smoother. Unlike Apple which has experience in 64-compatiblity introduced by iOS 7 last year, it is first time for Google to use 64-bit for Android 5.0. Fans are excited with this big change and expect more and more smartphones and tablets with 64-bit chips to come next year. It is hard to exactly figure out how efficient of iOS 8 in power saving because iPhone 6/6 Plus boasts a new processor to optimize battery usage. But, it seems that iOS 8 is not so superior to its former generations on getting long battery life. On the other hand, Android 5.0 Lollipop uses an additional battery saving mode to extend devices uses by up to 90 minutes and estimate time left to fully charge, which is helpful for playing full-length feature film on mobiles without no power problem. iOS 8 improves ID fingerprint sensor not only available to unlock the device, but allows users to access other apps for example free movie apps for iPhone 6/6 Plus. Android 5.0 Lollipop uses Android Smart Lock to secure smartphones and tablets by combing with Android Wear smartwatch. Plus, devices will be better protected against malware and virus with SELinux enforcing for all apps. iOS 8 and Android 5.0 Lollipop enhance notifications to reduce interruptions when you watch movies/videos, to reply text messages directly, to access camera with a single touch, to open the relevant app of notification. There are differences as well. iOS 8 notifications is interactive, enabling users to accept invitations, Like Facebook statuses and so on, while Android 5.0 Lollipop can rank notifications to let users receive the most important message at the first time. Certainly, we cannot judge which one is the best operation system for movies playback without a hitch. Both iOS 8 and Android 5.0 Lollipop drives us to experience bright and colorful design navigating users to access movies easily and improves performance enabling to play movies smoothly. On the other hand, iOS 8 is considered as the most efficient system to handle multitasking well during watching movies, while Android 5.0 Lollipop's battery saving technology brings a long-time movie enjoyment. In short, pick your favorite in terms of your needs. If you want to rip your DVD library for playing awesome movies on iOS 8 and Android 5.0 Lollipop during a journey, WinX DVD Ripper Platinum, the versatile DVD ripping and backup software will satisfy you. It is available to rip and copy any DVD movies to iOS 8 devices for example iPhone 6/6 Plus, iPad Air 2/Mini 3 and Google Nexus 6/Nexus 9 running on Android 5.0 Lollipop with possible highest audio/video quality. It enables to remove DVD encryptions such as CSS, Region Code, UOPs, Sony ArccOS, Disney X-project DRM and so on for playing any DVDs on iOS 8/Android 5.0 devices smoothly. 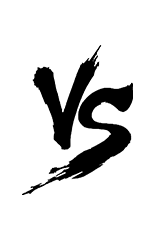 Built-in 350+ profile, it allows users to rip DVDs to MP4, AVI, WMV, MOV and other OS devices such as Windows Phone 8, Sony PS3/PS4, Xbox One/360 etc. Also, it can clone DVD to ISO image/VIDEO_TS folder and backup DVD main/full title to a single MPEG2 file at 1:1 ratio. Owing to Hyper-threading and Multi-core (up to 8) CPU support, it can convert feature-length DVD movies in a matter of minutes. Note: Please read copyright law in your country carefully when you decide to rip your DVD movies for iOS 8/Android 5.0 Lollipop using WinX DVD Ripper Platinum. 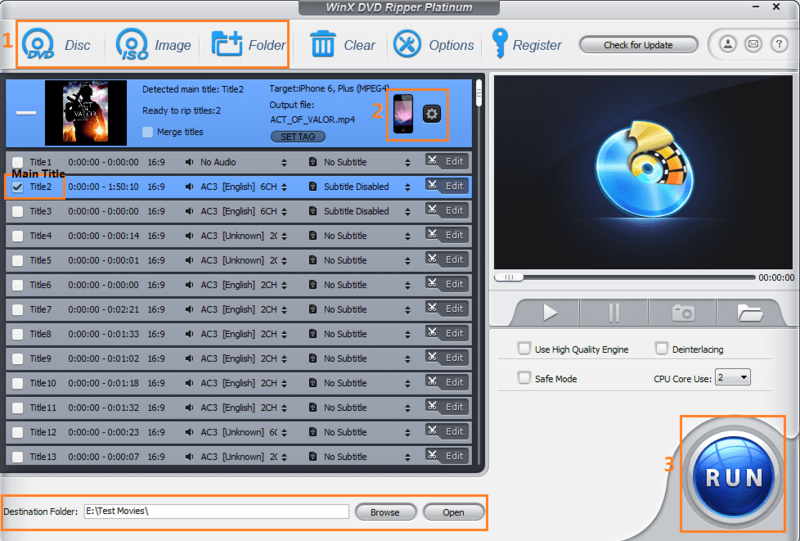 WinX DVD Ripper Platinum – Rip any DVDs (even copy-protected DVDs)/ISO image/DVD folder for devices running on iOS 8/Android 5.0 Lollipop and copy DVD discs to ISO/folder in turn or backup title to MPEG 2 file with possible highest quality.